If you are struck by the Costa Blanca South or the Costa Calida, if you want to live near the sea or if you want to leave the cold Nordic winter, trust in the professionalism and experience of our real estate in Torrevieja. Casas Espania is the trusted agency to buy a property in the southeast of the Iberian Peninsula (Spain). Our real estate agency wants to meet the needs of all customers who come to know us or who simply contact us. In order to achieve this goal, Casas Espania has a long and varied list of homes in perfect condition. We specialize in the sale and rental of properties, so your enjoyment and rest are the most important for us. We have a range of more than 600 homes for sale and for rent, where some stand out as our apartments, bungalows or villas. Beautiful properties to savour the pleasures offered by the Mediterranean coast. But at Casas Espania we also help the client find his greatest economic benefit. Our real estate agents will advise you the best investment with the plots that we have at your disposal. A wide and wonderful land to cultivate or build what you want, in order to get the most out of it. 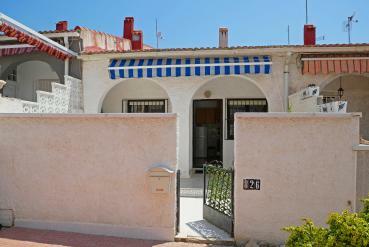 Where are the properties offered by our real estate in Torrevieja distributed? The Costa Blanca and Costa Calida are two territories of Spain that group more than 200 kilometres of coastline. Our real estate in Torrevieja wants its clients to have access to all the advantages of living in these wonderful Spanish areas. On the Costa Blanca South, in addition to offering properties in the same Torrevieja, we have fantastic destinations such as Guardamar del Segura, Orihuela Costa or Ciudad Quesada. In the Costa Calidad (Murcia), for its part, Casas Espania also offers the possibility of enjoying all the benefits of having a property near the sea. Los Alcázares, San Javier, San Pedro del Pinatar or Yecla are some of the main cities where you can buy a home. Now you can take the opportunity to live in an ideal home, to enjoy a perfect city. Get in touch with our real estate in Torrevieja and start to fulfil the dream you've always wanted. Visit us at Calle Bizet Centro Comercial Local 6 La Siesta - 03184 Torrevieja (Alicante). Call us on 0034 966 785 202 or 0034 669 366 996 or write us an email to info@casasespania.com.